Free up horsepower and replace your worn out smog pump with UPR Products Billet Ultralight II Smog-Air Pump Eliminator Kit with Double Bearing. Now featuring an industry first Double Row Ball Bearing for increased angular load and durability. 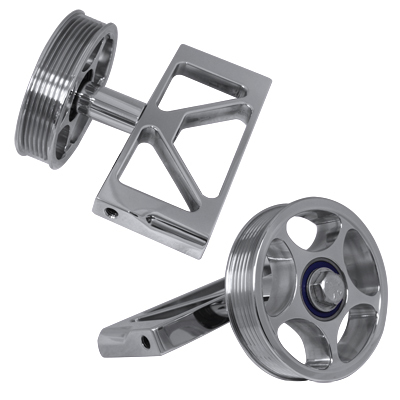 All new pulley specifically designed for the new Double Row Ball Bearing, stronger support shaft for better bearing support, heavy duty hardware and snap ring to avoid failures, that all our competitors smog pumps have, time and time again. This new kit has the best manufactured components with unmatchable quality and performance and offering the strongest design available anywhere. Includes everything for a fast easy installation with nothing else to buy. Maintains factory belt length and works with all supercharged applications. � Stronger support shaft for better bearing support. 1979 1980 1981 1982 1983 1984 1985 1986 1987 1988 1989 1990 1991 1992 1993 1994 1995 GT LX V8 302 Cobra Mustang Steeda Roush & Saleen Vehicles. 1993 1994 1995 Ford Lightning 5.8 No one else can stack up to the bold clean styling of our aftermarket Billet dress ups, Street Strip & Racing Suspension & Performance Parts for your late model American Muscle Car! Free up horsepower and replace your worn out smog pump with UPR Products Billet Ultralight II Smog-Air Pump Eliminator Kit with Double Bearing. Now featuring an industry first Double Row Ball Bearing for increased angular load and durability. 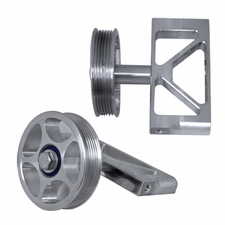 All new pulley specifically designed for the new Double Row Ball Bearing, stronger support shaft for better bearing support, heavy duty hardware and snap ring to avoid failures, that all our competitors smog pumps have, time and time again. 1979 1980 1981 1982 1983 1984 1985 1986 1987 1988 1989 1990 1991 1992 1993 1994 1995 GT LX V8 302 Cobra Mustang Steeda Roush & Saleen Vehicles.